A new form of enterprise collaboration is emerging. Office walls are coming down, sort of, and being replaced by giant interactive touchscreens that enable workers in different locations to collaborate on content. Interactive displays enable a whole new way for enterprise users to collaborate, said Irwin Lazar, a Nemertes Research analyst. These flashy hunks of hardware, loaded with versatile software, offer immersive collaboration with features like digital annotation, infinite canvases, touchscreen capabilities and video conferencing. Some of these interactive displays can span nearly 15 feet diagonally, weigh roughly 200 pounds and cost about $20,000. But, analysts warn, beware the bright shiny object, because these interactive displays have their shortcomings. 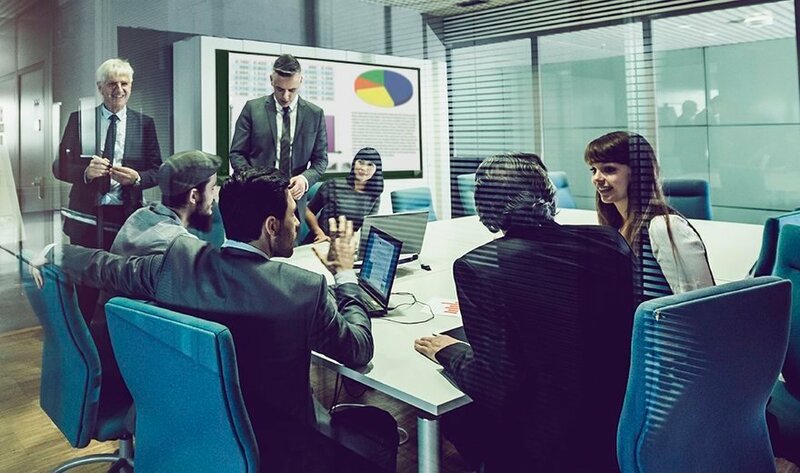 Interactive displays fill a missing link amid video conferencing and screen sharing. Namely, these virtual workspaces let remote users see content and comment or annotate on it for two-way, free-form, real-time collaboration, said Rob Arnold, a Frost & Sullivan analyst. Ordinarily, meeting participants might scribble a sketch on a Dry Erase board, for instance, and point a camera at the drawing so remote viewers could see what they're talking about. These interactive displays aim to iron out that collaboration wrinkle, Lazar said. But analysts caution that these products can be expensive, difficult to use and lack interoperability with other boards. Other key features to consider are the ink and touch responsiveness and screen resolution, said Alan Greenberg, an analyst at Wainhouse Research. Another drawback for some of these products is the inability to save and share work, according to some analysts. Additionally, these devices may be too much of a niche product, as they appear only in certain verticals, which include architecture, engineering and manufacturing. Enterprise buyers also need to consider how these hardware devices integrate with collaboration software, said Alan Lepofsky, an analyst at Constellation Research. For example, find out how closely the devices are tied into Office 365 or other apps. Certain apps may work natively on the screen. If not, you might have to plug in a laptop to the device to run certain programs. In coming years, the interactive displays market is expected to see healthy growth, according to MarketsandMarkets. Take a look at this slideshow to explore some of the key features in these collaboration canvases. How might large-scale interactive touchscreens help your collaboration workflow?